Today is Flag Day! On May 30, 1916, President Woodrow Wilson issued a presidential proclamation establishing a national Flag Day on June 14. Many Americans celebrate Flag Day by displaying the Red, White and Blue in front of homes and businesses. The day commemorates the adoption of the Stars and Stripes as the official flag of the United States. Do you know the flag's history? 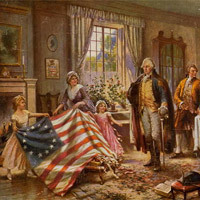 According to American legend, in June 1776, George Washington commissioned Betsy Ross, a Philadelphia seamstress, to create a flag for the new nation in anticipation of a declaration of its independence.